The Quaker Tapestry began in 1981. A project to brighten up the children’s room – little did they know then that it would brighten up many rooms! We’ve been touring with the Tapestry panels since the late 1980s all over Britain and the world. An unqualified success, our roadshow attract huge numbers of visitors to each venue. 1,513 visitors in 13 days experienced the warm welcome at Temple Methodist Church in Taunton. 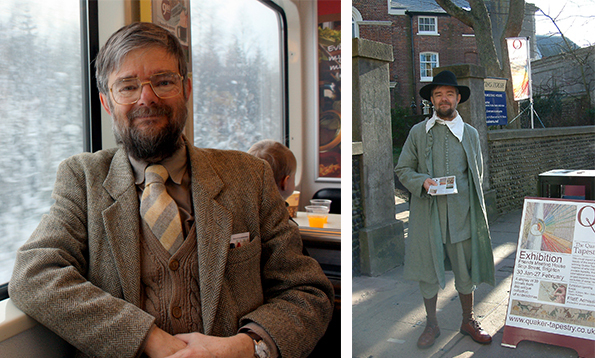 They saw the Quaker Tapestry, hear the stories and sample the tea and cake! A big thank you to all those who helped to make the ‘Homecoming’ Quaker Tapestry Roadshow at Taunton a great success and a wonderful celebration of its small beginnings in Taunton 36 years ago. 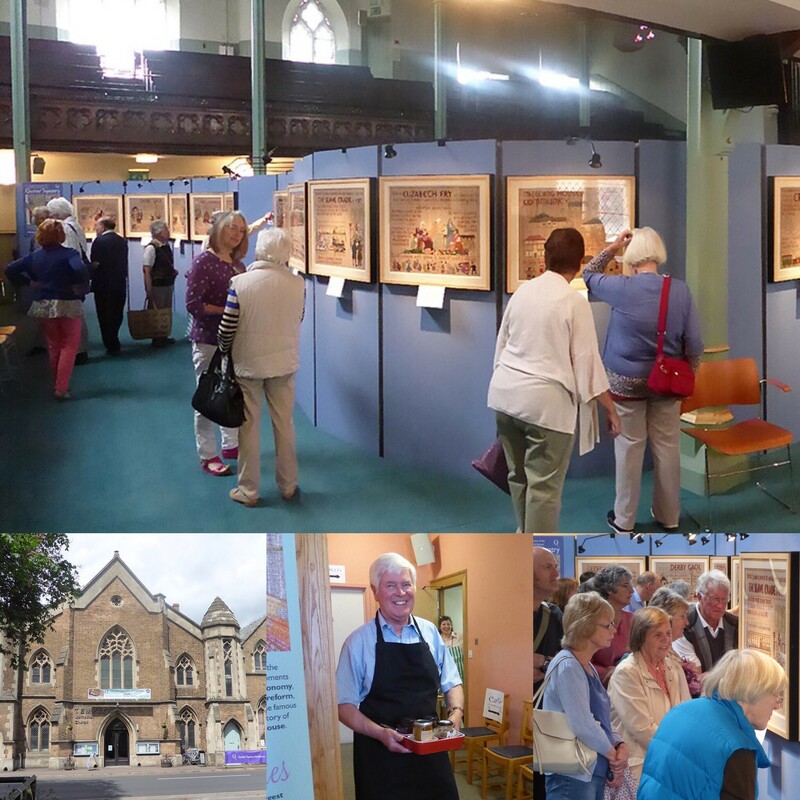 Temple Methodist Church, a beautiful building, was the perfect venue for this community based exhibition. A small team of people, both from Temple and the local Quakers in Taunton, were many months in the planning; meeting together; collaborating and communicating for the launch and publicity; and organising people to sign up to volunteer their time in stewarding the exhibition or hosting a visiting volunteer, not to mention the fundraising! 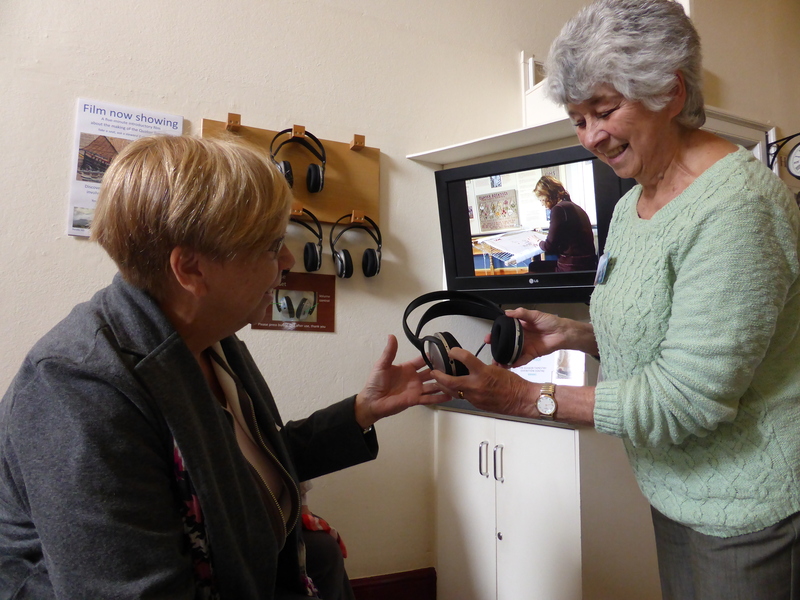 Over 100 volunteers, both in the exhibition and in the ‘Pop-up Cafe’, generously gave over 650 hours of their time, help and expertise over two weeks to ensure that our visitors had such an enjoyable experience. Local embroiderers joined in the fun too! This was one of the best community Roadshow events we have been involved with. Pamela Gould’s display of memorabilia showed a flavour of how they created their panel ‘Criminal Justice’. A first for the Roadshow and it certainly enhanced the visitor experience. We enjoyed meeting several people who had been involved in the early days of the Tapestry, reminiscing about their stories. Visitors’ comments will continue to be testament to a wonderful Taunton Roadshow experience….